A partnership between Textron and New Holland bares fruit with the launch of the New Holland Rustler 850. 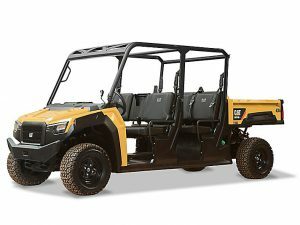 Textron Specialized Vehicles continues to expand their footprint in the small, task-oriented vehicle market partnering with New Holland to produce the Rustler 850 utility vehicle. 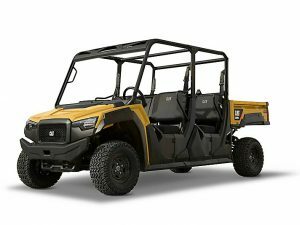 New Holland, a leading manufacturer of agricultural machinery, turned to Textron 18 months ago to help them update their Rustler brand of utility vehicles with a new vehicle. The partnership makes sense for both companies. For Textron Specialized Vehicles, the partnership gives them access to New Holland’s well-established distribution channel in the ag market. 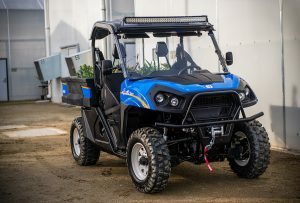 For New Holland, they can more efficiently use their product development resources by taking advantage of Textron Specialized Vehicle’s expertise in utility vehicles. One challenge for the new vehicle will be the relatively depressed demand in the ag market that has been ongoing for a number of quarters. Current available attachments include a LED light package and winch with a cab with heater, electric dump bed and camo graphics in development. A four-person version is also in the product line plan. The Rustler 850 will be available this spring. 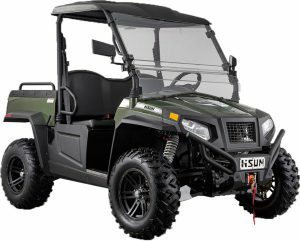 The new Sector E1 electric UTV from Hisun Motors. HISUN Motors takes a big step forward with the announcement of the all-new Sector E1 electric Utility Vehicle, adding yet another quality vehicle to their line-up. Building on the success of the Sector UTV line’s performance and modern advancements in electric technology, HISUN is excited to enter the growing electric UTV market. The Sector E1 4×4 is a mid-size UTV which provides quiet performance thanks to its powerful 48 volt 36hp AC drivetrain. The Sector E1 starts at an MSRP as low as $10,199. HISUN’s Sector E1 features 4-wheel independent nitrogen suspension, 4-wheel drive, 4-wheel hydraulic disc brakes, and an industry best run time. The Sector E1 is the first electric UTV on the market with the Discover EV Traction Dry Cell Battery technology that is maintenance free and designed for longer run times and a longer life. The Discover EV Traction Dry Cell Battery is also recyclable, built from recycled parts, and will deliver an estimated 45 miles on a single charge. HISUN has leveraged superior North American technology for integral components such as the Kinetek Motor, Delta Q IC1200 Chargers, and 450 Amp Sevcon Gen IV controllers. Dealer and customer feedback has helped refine the end product of the vehicle resulting in the Ultimate Electric Utility Vehicle. Comment: Whereas in the past electric utility vehicles have mainly been targeted at the hunting market, newer models like the Sector E1 are looking for a broader appeal for work or recreation applications. In part the trend is because the hunting segment has turned out to be a niche market, but advances in battery and powertrain technology is also increasing the range and potential end use applications for electric UTVs. A wireless recharging system from Momentum Dynamics. Comment: The cost of the charging system could be a major factor for LSV or golf cars, but there could be a lot of potential in the golf car fleet market. It would simplify the process and the faster throughput would help recharge and turnaround fleets faster at very busy courses. Even in the personal transportation market, the technology would simplify the process and help alleviate the problem of people forgetting to charge their golf cars and LSVs. The UForce 800 from CFMoto. Comment: The more well known brands in the UTV market have been able to consistently increase prices for their vehicles for a number of years, reflecting the strong demand for UTVs as well as ongoing improvements in the vehicle offerings. While the name brand vehicles continue to offer value even at their higher price points, they are providing space in the market for even more value oriented competitors in the $8,500 – $11,000 price range. CFMoto has found some success in this space as well as companies such as Kymco. Typically this success has been with work utility vehicles and some recreational use vehicles. However, the latter are not for the more hard-core sport or high performance recreational use. It’s all about buying a specific set of functionality combined with sufficient quality to get a job done for a reasonable price. New solar panel offering from Club Car. Comment: Club Car now joins GEM and Evergreen Electric Vehicles in offering a solar option for their vehicles. Evergreen and GEM also offers a SolarDrive product. GEM offers 220 watt and 410 watt systems for $2,500 and $4,000 respectively. Pricing was not provided for the Club Car product.